This morning, Pj stayed home sick from work and I tried to keep the kids busy and quiet so he could rest. We went out to pick up a few things for an Alice in Wonderland tea party, just the three of us. We made "Queen of Hearts Tarts" which is home made strawberry jam thumbprint cookies. The kids love to bake and thumbprints are a great cookie to make year round. I used this recipe from Simply Recipes, without the nuts. My grandma gave me this tea set when I was pregnant with Olivia. It had been packed up with my wedding china since we moved in two years ago! This morning, it popped into my head and I thought "I hope I still have that set!!" My kids don't eat grilled cheese sandwhiches but when presented with such a fancy lunch and re-named "toasties", they each ate two. Rhys loved the chessman cookies, except for the "lightbulb" ones-haha! So gorgeous! I love that tea set, it is so adorable. I love all of your ways of interpreting the theme in the food. 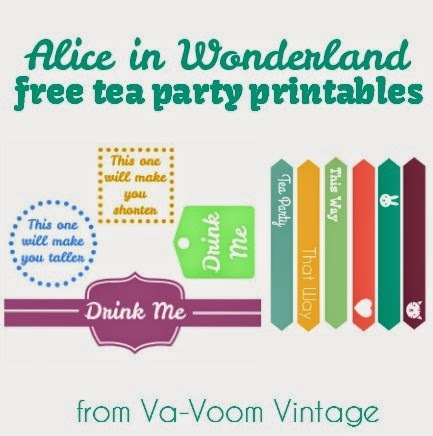 I have some of the Alice tea set! I picked them up few years ago, only I don't have the teapot from the set. I have a different Alice in Wonderland teapot that's in the shape of a book. They're awesome. What a great use for an amazing tea set. You could invite me for tea any time. So very cute and what fun for your kids!